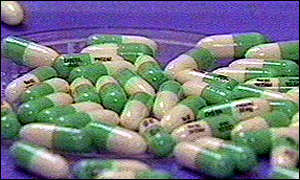 Thousands of people in the UK could be hooked on the anti-depressant drug Seroxat, without knowing it. Dr David Healy, a UK expert in antidepressants, has said he has seen records of trials carried out by the manufacturers which showed healthy volunteers were suffering withdrawal symptoms after taking the drug for just a couple of weeks. He said more than half of people on Seroxat may have "significant" withdrawal problems. He said: "For most people who take the drug, one of the key points that will concern people is that Seroxat (paroxetine) could make you physically dependent." Dr Healy, director of the North Wales department of psychological medicine was given access to the results of early trials of the drugs while a witness in a US case. The case dealt with a seperate concern about the drug, which is that some people who take it could become violent towards themselves or others. The family of David Snell won a $6.4m payout from manufacturers GlaxoSmithKline (GSK) after Mr Snell was found to have murdered three members of his family, and himself, after taking the drug for just two days. The company denies the link and is appealing against the decision. Two weeks earlier, in Australia, a judge ruled Sertraline, a drug in the same family, had caused David Hawkins to murder his wife and attempt to kill himself. Dr Healy told BBC News Online, of the 100m people world-wide who were on Seroxat, one in 1,000 could have a suicidal reaction. There have been concerns expressed in the past about antidepressants such as Prozac making healthy people with no history of mental illness feel violent. Seroxat is part of a family of antidepressants called SSRIs (selective serotonin re-uptake inhibitor) which were introduced to the market in the early 1990s. They were a replacement for benzodiazepines such as Valium and Librium - and their selling point was that people would not become physically dependent on them, unlike the older drugs. Dr Healy was given access to GSK's archives because he was an expert witness in the Snell case. And he said a trial a study of 34 healthy company workers by GSK, carried out before Seroxat was licensed, showed 25% became agitated. Dr Healy believes a small number could be so disturbed by the effects of SSRIs that they could kill. He said some of those involved in the pre-licensing trial had gone on to "suicidal acts". He wrote to the Medicines Control Agency, which grants drug licenses in the UK, and said: "The relationship between their intake of paroxetine (Paxil/Seroxat) and later suicidal acts is a matter about which neither you, nor SmithKline Beecham should be sanguine." Dr Healy said the company has failed to pass on information to patients or doctors. He says a study which looked at the effect of stopping the drug for people who had successfully been treated for the depression showed many got worse. The company argued this meant the drug should be licensed for long term treatment of depression. He said the drug should carry warnings that some people who take it may experience violent or unusual thoughts, which were linked to the drug and not their condition. And he said doctors who were treating people who suffered symptoms after coming off the drug "should be aware that maybe the underlying problem has cleared up and maybe the symptoms are due to withdrawal." Alan Chandler, a spokesman for GSK denied Seroxat was causing dependency, withdrawal symptoms or violent tendencies. He said independent analysis last year by the MCA and others had concluded SSRIs did not cause dependency. He said: "Withdrawal symptoms may occur with all SSRIs if treatment is abruptly stopped. This is not a sign of addiction or depression."